It may seem like something that may never happen to your roof but when you come home and realize there is a big puddle of water in the middle of your living room you’ll quickly realize you need roof repair on your home. Roof leaks can occur for a variety of reasons and just because you have a newer roof doesn’t make you immune to them. High winds and storms can cause damage to your roof if they are bad enough. Things like falling tree limbs can cause damage as well. Getting roof repairs in Brighton Michigan no matter what causes the roof damage is very important as the inside of your home can be damaged by the roof leak. If your roof is leaking it’s very important to get it repaired as quickly as possible. By allowing a roof leak to continue it can cause many other problems in your home. The initial water leak into your home can cause damage to the insulation in the attic as well as the drywall on ceilings and walls. Allowing the water to continue leaking can cause other problems however which include damages to furnishings, damage to lower levels of the home, and also even mold growth in your home which can be unhealthy. That’s why it’s so important to always get the roof repaired as quickly as possible to prevent further damages. Allowing the water to continue leaking can cause other problems however which include damages to furnishings, damage to lower levels of the home, and also even mold growth in your home which can be unhealthy. That’s why it’s so important to always get the roof repaired as quickly as possible to prevent further damages. When you have a roof leak on your home it’s very important to always use a fully qualified roofing contractor in Brighton Michigan. When your roof is leaking it’s very important to always use fully qualified roofing experts. At Livingston Roof Pros we have roofing experts on hand that are qualified on a variety of roofing materials and products. Allowing someone to repair your roof that is not qualified may have a disastrous effect on your home’s roof. Not only will the roofing repair fail over time but if it’s not done correctly it may void the warranty on the roof. This is especially problematic because it’s so difficult for home owners to determine this even happens until after the project is completed. At Livingston Roof Pros we always make roof repairs with qualified individuals and according to manufacturers specifications to ensure your roof warranty remains in tact. Having a roofing contractor who experiments on your home because they don’t have the experience installing the roofing material needed for your home. At Livingston Roof Pros we have roofing experts that have extensive knowledge in a variety of roofing materials. In fact, we won’t take on a project if we don’t have the adequate personnel that is experienced in those materials of the project. At Livingston Roof Pros we always strive to give you the best service available for your roofing project and with a team of professionals we have decades of combined experience in residential roofing in the Brighton Michigan area. At Livingston Roof Pros we offer many roofing related services. From simple roof repair services in Brighton Michigan to installing a completely new roof on your home we can help. We also offer roof inspections as well for your home. 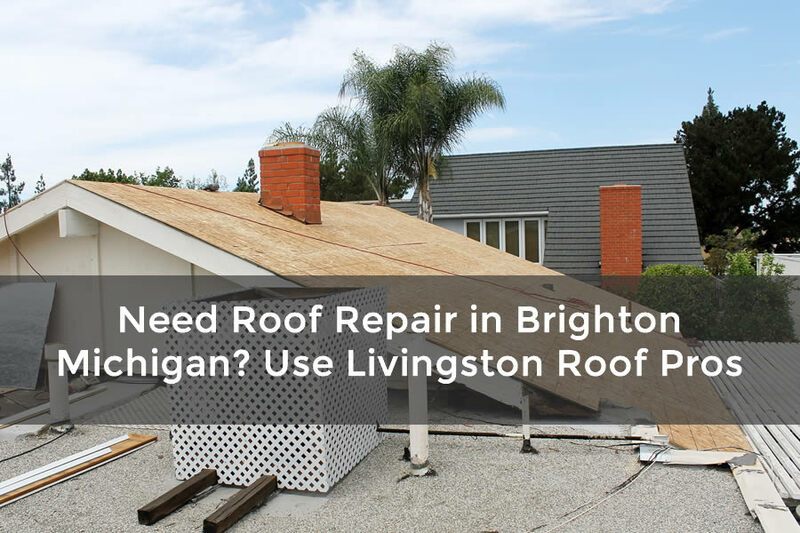 If there is a problem with your home’s roof in Brighton Michigan be sure to call Livingston Roof Pros today. We can help with almost any residential roofing project you may have. There are some options that are available to you if you would like to save money on your home’s roof repair or roof replacement. Our roofing experts can help you choose the best options for your home and offer economical choices that can help save thousands on your new roof install. Plus, we offer financing options for home owners with approved credit. Call us today and speak with one of our customer service representatives for more information. You can also get a free quote for your roofing project as well. Call Livingston Roof Pros today at 517-940-8770 to get started today.